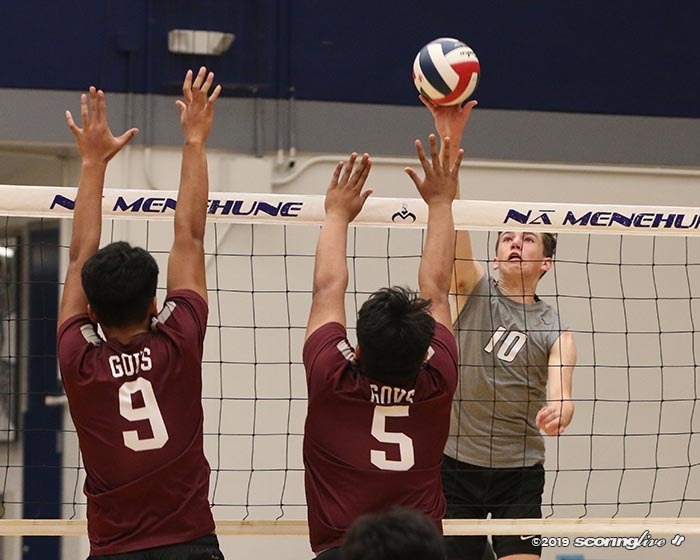 Although there was a lot more scoring in Hilo's second straight postseason meeting with Maui, the Vikings' defense rose to the occasion in key situations. Two first half stops in the red zone was the difference maker in ninth-ranked Hilo's 35-24 seesaw win over Maui at Keaau Stadium in the semifinals of the First Hawaiian Bank Division I Football State Championships last Friday night. 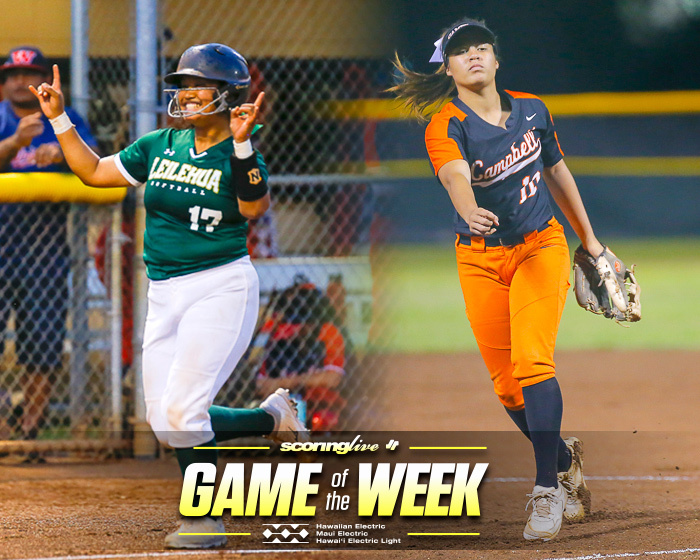 The Vikings' stingy effort to start the game helped Hilo take a 21-10 lead at the half, which also proved to be the final point differential. "That's our mentality when we go on the field. 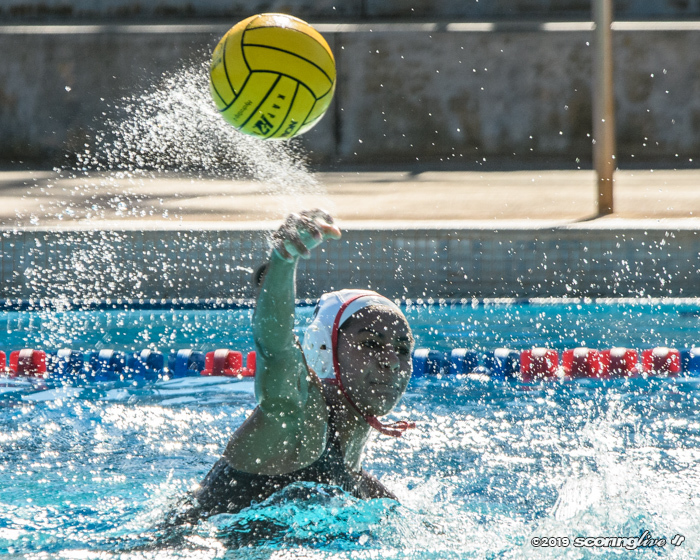 It's an adrenaline thing for the defense," said senior rover Kahiau Walker. 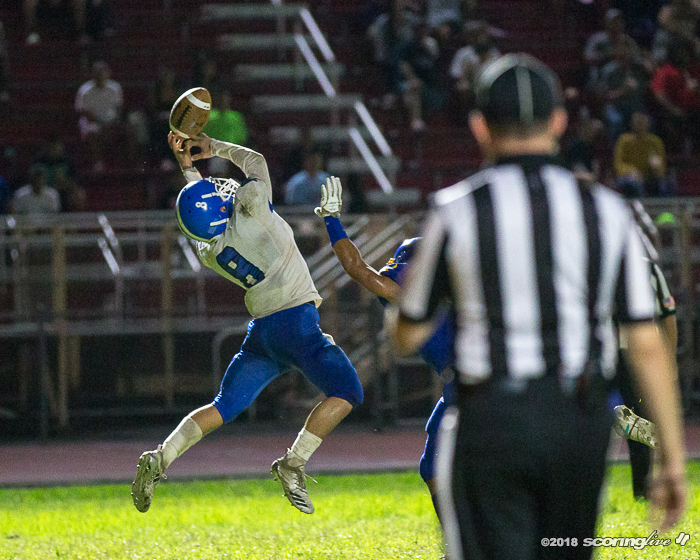 Hilo's defense was first put to the test midway through the opening period when the Sabers intercepted a shovel pass attempt at the Hilo 14. Maui burned a timeout at the change of possession, but couldn't get anything going on its next two plays and faced a third-and-12 situation. After another timeout, Maui quarterback Brex Delray tried to get the ball to Mitchell Hirose — who was tightly guarded by cornerback Elijah Apao — in the right side of the end zone. Delray couldn't connect on the pass and had to kick a 32-yard field goal, making it a 7-3 game. After failing to get a first down on their first four possessions, the Sabers found success on their fifth drive as they had three consecutive plays that went for 10 yards or more. 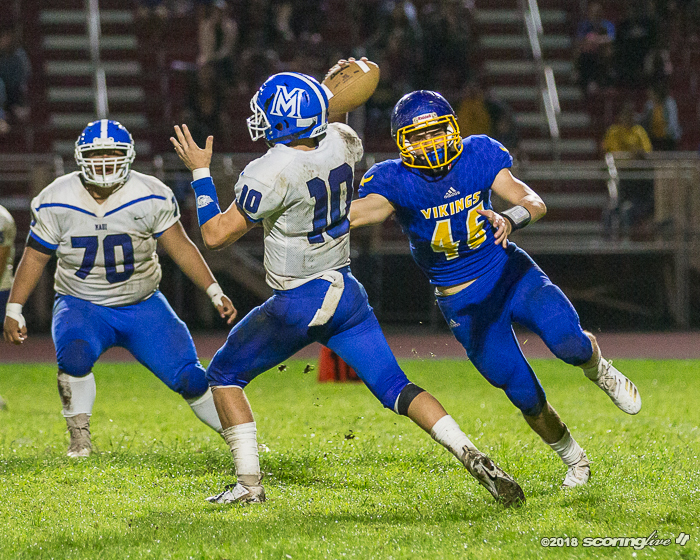 They were able to advance the ball all the way from their own 25 yard-line to the Hilo 15. But that's when the Hilo defense clutched up. 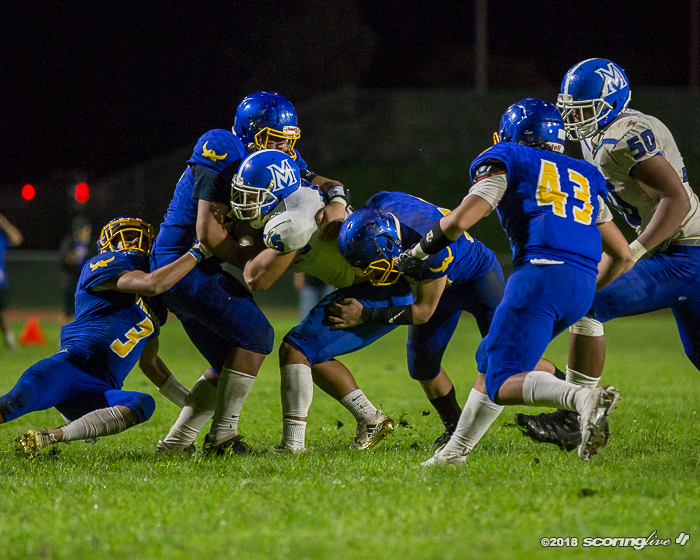 After a run for no gain, the Sabers went into their bag of tricks. Taelen Bates stepped in behind center and handed the ball off to Naia Nakamoto, who then pitched it back to receiver Torryn Kauhaahaa-Sulusi on a reverse. While the misdirection was going on, Bates slipped out of the back field and ran down the left sideline to catch a pass from Kauhaahaa-Sulusi. However, the Vikings were not fooled on the play as they used the sideline as a defender and Bates caught the would-be-touchdown pass out of bounds. Maui ran another pass play on the next down, but Delray's pass to the middle of the end zone was too high. 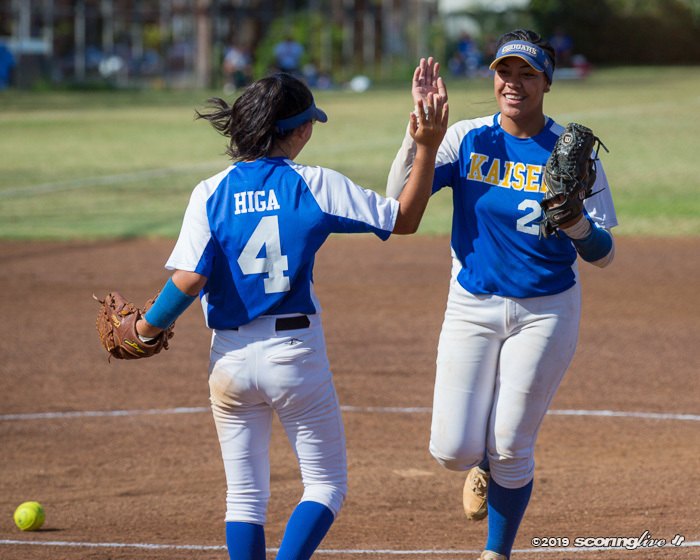 "There were a couple times that we were down deep in there, and the kids stood strong," said Hilo coach Kaeo Drummondo. The Vikings converge on Maui RB Naia Nakamoto in the third quarter. 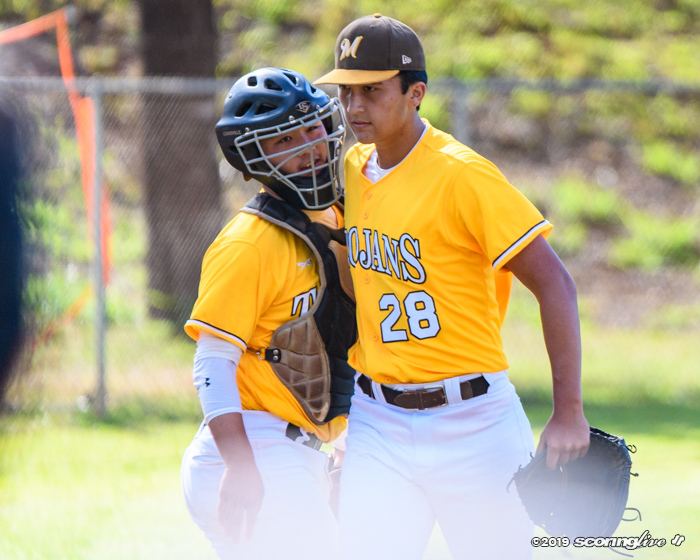 The need for creativity by the Maui offense was also because the Vikings were doing a good job containing Nakamoto, who entered the game as the state's leading rusher with 1,353 yards and 16 scores. Hilo held Nakamoto to a season-low 24 yards on 12 carries in the win. So Maui went to the passing game to get Nakamoto the ball in space. Instead of kicking a field goal, the Sabers elected to go for it on fourth-and-10 from the Hilo 15. The Sabers motioned Nakamoto before the play and tried to get him the ball on a wheel route near the front right corner of the end zone. An illegal shift penalty made the play invalid, but it didn't matter as Apao was there to break up the pass to force a turnover on downs. "Our game plan was mainly on No. 5 (Nakamoto)," said Apao, who also made the game-sealing interception in the fourth quarter. "He was 60 percent of their offense and we did what we had to do and got it done." Had Maui scored on the fourth down attempt, the Sabers would have taken a 10-7 lead. Instead, the Vikings drove the length of the field in 11 plays to go up 14-3 on Guyson Ogata's 2-yard TD run at the 7:31 mark of the second quarter. After Maui turns it over on downs inside the RZ, Hilo makes them pay, driving 85 yards before G. Ogata's TD run. Vikings up, 14-3 (7:31/2Q). Nakamoto would find the end zone on a 70-yard catch-and-run on Maui's next drive, but the slow start offensively ultimately came back to hurt the Sabers in the end. 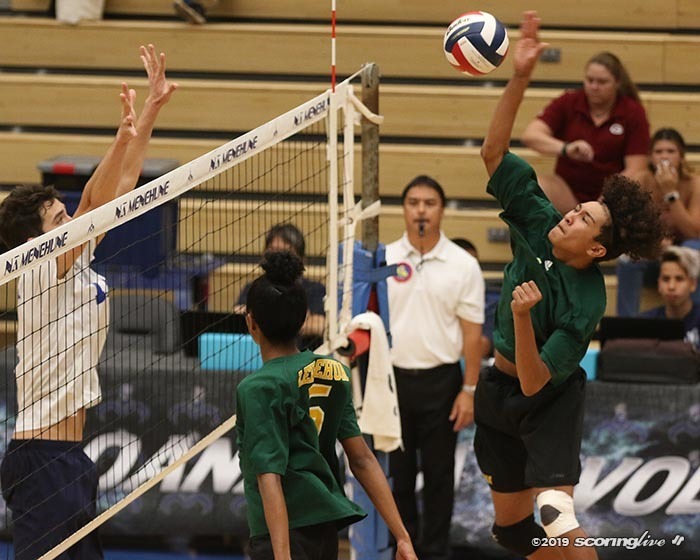 "I give a lot of credit to Hilo and their head coach and defensive staff," said Maui coach James Kammerer. "They move around their D-line and bring their linebackers so it tends to confuse the offensive line a little bit and we weren't maintaining our gap responsibilities and people were sneaking through." Hilo — who beat Maui in last year's semifinals, 26-7, before moving on to win its first-ever state championship — will meet Waipahu on Saturday, Nov. 24 in the D1 final. Kickoff is slated for 4:30 p.m.